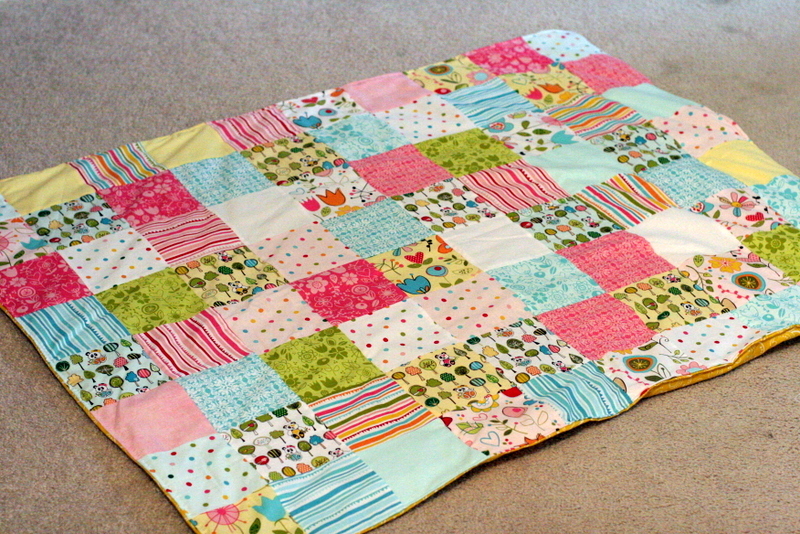 Sunny Happy Skies Quilt Is Finished. Meh. 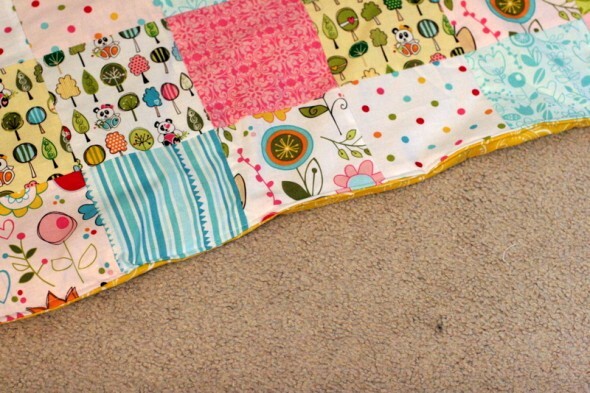 Other posts on this topic: Sunny Happy Skies Quilt Pt. 1, Sunny Happy Skies Quilt Pt. 2, Sunny Happy Skies Quilt Pt. 3. I have been in the craftiest funk evvverrrr. I’ve barely sewn anything for most of 2013, it has not been a great year for my sewing machine. I made H’s crown, which I loved, but I had kind of a negative experience posting about it. So that took some of my mojo away. Since I got the news about my job back in March, I really have just been working to balance life at home, trying to work from home, and chasing a toddler. I feel a little guilty when I sit at the sewing machine. 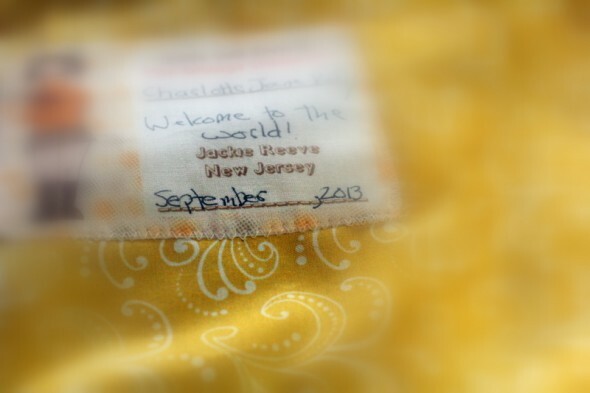 Not to mention the fact that I made the mistake of joining another quilting bee, through the Jersey Shore Modern Quilt Guild. So I was feeling the pressure of the mounting pile of bee blocks I owed everyone until I finally quit the bee for my own sanity. I should have known, this is what happened last time I joined one (or, actually, three). My beloved sewing machine has dust on it. So, to make a long story longer, this poor quilt has been wallowing in my crafty funk for months. I had so little left to do on it that I boldly went ahead and started to date the label last time I touched it. You will note that it is actually now November, but there isn’t much I can do about that at the moment. I don’t why it took me so long to get back to it, but I finally did today. It is not my best work, and I am no longer sure I will even give it to its intended recipient. 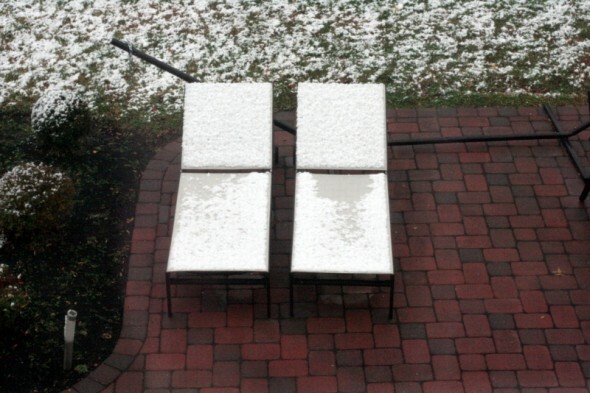 But it’s snowing here this morning, which I am so very excited about! So excited that I made hot chocolate and wanted to be crafty. But I needed to clear the decks before I could concentrate on anything else. So I finished this quilt, and despite the complete despondence of this post I’m actually really excited. I’ve finished something that’s been looming over head for a while, so even if I don’t give it away I have cleared up my desk for new, shiny tasks. Sometimes you just have to accept that certain projects were not meant to be. I may go by that baby some clothes instead. I’m happy that you cleared the decks.